Saturday, August 30th, the Rhody Cruisers will be celebrating, with the public enjoying Gifts for the kids, Free Sodas and Hot Dogs at this community support day. KCST will have live remote from 11-2 PM. Cars can start parking at 8:00 AM. Linda Brown will be there selling tickets for her Old Hats Show at the Senior Center to the ladies. Tickets are $15.00 each for the October 18th event sponsored by the Lions. 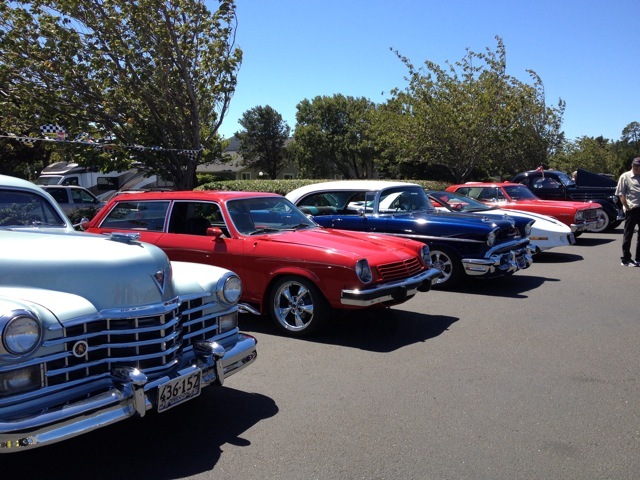 I heard there was a club show (Rhody Cruisers) at Les Schwab… Maybe 30 cars. OK, Ill check it out. What followed was bright sun and ever increasing wind. Free Hot Dogs, Les Schwab posters and coffee cups… Oh, MY! Lots of people walking thru. — I Told everyone my boy Mark was lead wrench and co-visionary. All together a pretty fun day.